The big issue for me [before I converted] was the presence of Jesus Christ in the Eucharist. I came to realize that no amount of intellectual argument and debate could convince me one way or the other; I had to believe the words of Jesus himself in John 6 [we heard some of those words a few moments ago in today’s Gospel reading]. One day it hit me that if Christians can believe that Jesus Christ was born of a virgin, came back from the dead, ascended into heaven and is God Incarnate, then why should there be any problem believing in the real presence of Jesus in the Eucharist? The Incarnation, the Resurrection and the Ascension are—historically speaking—past events. The real presence is troubling because it exists in the here and now. Obviously David Alcorn spent a great deal of time thinking about the Blessed Sacrament during his latter days as a Protestant. He thought about the Eucharist often and deeply, and it ultimately led him to embrace the faith of the Catholic Church. 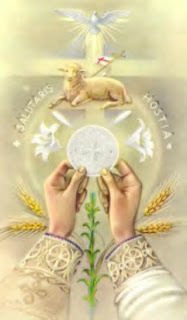 On this Corpus Christi Sunday, it’s important for us to “think” about the Eucharist as well, for the sake of our faith. First of all, we need to “think" of what the Holy Eucharist is (or perhaps I should say we need to think of WHO the Eucharist is!). This is something that really troubled David Alcorn: How could ordinary bread and wine substantially change into the Body and Blood of Jesus Christ, while at the same time appearing to be ordinary bread and wine? This was a problem for him, until he realized that any God who could bring about a virginal conception, and then rise from the dead, and then ascend into heaven was more than capable of performing the miracle we call the Blessed Sacrament! I trust that we all believe the same thing. Of course, if we do, then that belief should be reflected in our behavior. For example, when people went to see the pope a few weeks ago in New York, they were instructed to arrive several hours early, for security reasons. And they did. Well, Jesus Christ, who is present Body, Blood, Soul and Divinity in the Holy Eucharist, is much greater than the pope! And yet, how many of us come to Mass last minute every week—or several minutes after it’s already started! Do we really believe he’s here? When people go to see kings and other important men and women here on earth, they’re very concerned to dress well, and show proper respect. So how do you normally dress for Mass—especially in the warmer weather? That’s a good question for each of us to think about today. Do we dress like we’re coming to see and have an audience with the greatest King of all? And what about our internal attire? Do we examine our consciences before we go to Communion, to arrive at a moral certitude that our soul is in the state of grace? Or do we invite the King of kings into a “temple” that’s desperately in need of a major spiritual cleansing? And by the way, missing even one Mass without a good reason is a serious sin that needs to be cleansed (i.e., absolved) before one can receive the Eucharist! I mention this after the very poor attendance we had a few weeks ago at our Ascension Thursday Liturgies. And I had four of them instead of the usual three! Holy days, remember, are just like Sundays in terms of our obligation to be present. Perhaps we’ve neglected some of these things because we just haven’t thought about them. Well, that’s precisely why I’m bringing them up in this homily. As I said a few moments ago, today is a day to THINK about the Eucharist for the sake of our faith. In this regard, we should also think of what we’re saying “Amen” to when we receive. Amen, as all our second graders know from their First Communion studies, literally means “I believe”. It’s what we’re supposed to say with conviction and clarity after the priest, deacon or extraordinary minister says to us, “The Body of Christ.” I mention that little detail because many people say nothing—or “thank you”—or some facsimile thereof! If we don’t believe what the Church teaches, then we should not receive. This, incidentally, is why Protestants and non-Christians are not invited to receive Jesus at Communion time in the Catholic Church! It’s not because we Catholics don’t like them; quite oppositely, it’s because we love them and we don’t want them to lie in public! If they come to our altar and receive, they are saying by their actions that they believe EVERYTHING the Catholic Church teaches authoritatively on faith and morals. But, of course, they don’t believe all that the Church teaches—otherwise they’d be Catholic! And the reverse is also true. We do not believe all that the Episcopalian, Lutheran, and other Protestant churches teach, so we must not receive communion in those churches—even if the Protestant minister conducting the service says it’s ok! Please remember that, the next time you’re at a funeral or wedding at Christ Episcopal Church, or some other Protestant church in the area. Obviously receiving Jesus in the Eucharist is a privilege for baptized Catholics who are in the state of grace and in good standing in the Church. Today we should THINK about this privilege and THANK GOD for it, because we can easily take it for granted. We should also thank the Lord for the privilege we have to commune with him either in the tabernacle or in the monstrance in Eucharistic Adoration. On that note, when was the last time you made a visit to church during the week—at a time when you didn’t have to be here—to adore your Eucharistic Lord? When was the last time you made a holy hour? You could make one at noon today—a walking holy hour, so to speak—by participating in the Eucharistic procession from Immaculate to St. Pius. e) many graces for others, both the living and the dead. The reflection ends with a simple question: Will a few extra minutes of sleep repay you for all these losses? The answer, of course, should be obvious. 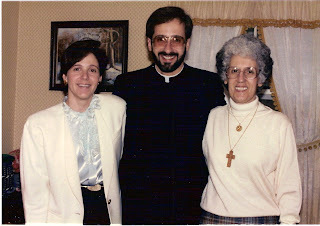 My sister, my mother and I sometime in the late 1980s. For most preachers here in the United States, this Sunday brings with it a big challenge: How do you connect the religious feast we’re celebrating in the Church (Pentecost) with the secular feast we’re observing in the wider culture (Mother’s Day)? But for me, it’s relatively easy—not because I’m a great preacher, but rather because of who my mother was. The connection between my mother and Pentecost is ultimately rooted in her Baptism and Confirmation (both of which happened in the 1930s), since she received a sacramental outpouring of the Holy Spirit on both those occasions. But the connection is also rooted in another event in her life which happened when she was in her early 40s, and which is similar in many ways to the Pentecost event as St. Luke describes it to us in today’s first reading from Acts, chapter 2. It was 1972, as I recall. My father had died just the year before, and my mom was visiting a couple from our parish at their home, which was two streets over from ours in Barrington. There were several other people present at this gathering, including 3 non-Catholics, who began to talk about things like “the charismatic gifts of the Holy Spirit” and a phenomenon they referred to as “the baptism in the Holy Spirit.” Some of it was confusing—and I’m pretty sure most of the Catholics there thought these 3 Pentecostal Protestants were absolutely crazy—but my mom listened intently, and was really intrigued by what she was hearing. So she did. He then led her in a brief prayer of repentance and commitment, in which she asked the Lord to forgive her for her sins, and in which she professed her faith in Jesus Christ as her Lord and Savior. At that point he and his friends put their hands on her head and shoulders and they began to pray—not formal prayers, but very spontaneously. Some of it was in English, and some of it was in this strange language that she didn’t understand. And my mom experienced what she believed to be the presence of God. She did, and some words came out that she didn’t recognize, but she felt very peaceful, so she continued to do it. When it was over several minutes later, they told her that she had just experienced the “baptism in the Holy Spirit” and had prayed in tongues, as Peter and the apostles had done on the very first Pentecost. Now just in case some of you are thinking, “Fr. Ray what are you talking about? This sounds really ‘Protestant’ to me!” let me make myself perfectly clear: The Catholic Church recognizes as valid not only the theological gifts of the Holy Spirit (faith, hope and charity) and the seven gifts of the Holy Spirit mentioned in Isaiah 11 that we usually associate with Confirmation (wisdom, understanding, counsel, fortitude, knowledge, piety, and fear of the Lord). She also recognizes as real and valid the so-called “charismatic gifts of the Spirit” mentioned by St. Paul in 1 Corinthians 12: gifts like healing and miracles and prophecy and tongues. It’s interesting, probably more teenagers than adults in our parish have been exposed to these gifts. I say that because the teens see at least some of these charisms in operation at the Steubenville Youth Conferences we attend every July. Most adults haven’t experienced them unless they’ve come to our monthly prayer meeting. Although I will tell you that I pray in tongues at every Mass I say—just not out loud for people to hear. I find it to be a very helpful way to pray when my own words fail me. First of all, so that we will all take the gifts and power of the Holy Spirit seriously in our lives—because I fear that many Catholics don’t. And secondly, I mention it as a way of saying thanks to my mom. She’s been gone now for almost 18 years—she passed away back in 1990—but I trust that where she is she can still hear me. My mom taught me a lot of things, but one of the most important lessons I learned from her was to be open to “everything that is true, everything that deserves respect, everything that is admirable, pure, honest, decent, virtuous and worthy of praise”—to quote a line from St. Paul. And that includes the charismatic gifts of the Holy Spirit! She taught me that by her example, as I’ve hopefully just made clear. Which is simply another way of saying that my mom taught me to be “Catholic” in saying yes to truth—all truth—and no to error. And I really needed to learn that lesson because when she was first baptized in the Holy Spirit and began to go to prayer meetings at St. Augustine’s Church in Providence, I was very uncomfortable with it. I was 15 years old, and it all seemed a bit strange to me, to be perfectly honest. In this context I should also mention that even after she became part of the Charismatic Renewal, my mother’s favorite type of prayer was what they call “contemplative prayer”—the quiet kind you find in monasteries. In fact, one day a month she used to go to the Carmelite Monastery in Barrington to spend the day in silent meditation and contemplation. And yet, at a prayer meeting, she could “cut it loose” and praise God as enthusiastically as anyone. She was open to all different types of prayer—everything from the charismatic to the contemplative—provided the Church approved of them. Suffering for the sake of suffering. Suffering for a righteous cause. Suffering for a person you love. The Catholic Church believes in the last two—she does NOT believe in the first, although she’s often accused of it! How often have you heard people say, “Catholics love suffering”; “Catholics enjoy suffering”; “Catholics are into suffering”? Now I can’t speak for every individual Catholic, so maybe there are a few people in the Church with masochistic tendencies, who get their jollies out of experiencing pain for the sake of experiencing pain. But I’m definitely not one of them! And probably neither are you. Which is just fine, because nowhere in the Bible or in the Catechism does it say that we must love and embrace suffering for its own sake. Despite what the comedians and critics of the Church tell us, this is not a Catholic doctrine. But what the Church and the Scriptures do teach—especially through the Cross of Jesus Christ—is that suffering does have value when it’s embraced for the sake of a noble, righteous cause; or when it’s embraced for the sake of someone you love. And you know what? On some level, even atheists believe that, as I hope to make clear in a minute. Jesus didn’t suffer because he enjoyed it (if you saw Mel Gibson’s The Passion of the Christ you know that he definitely did NOT enjoy it!). Rather, he willingly embraced his suffering—his Cross—for a righteous cause (the most ‘righteous cause’ of all—the salvation of the human race), and out of love for other people (sinners like you and me). He says that because if you suffer for doing evil, you’re not suffering for a righteous cause or out of genuine love for others! You’re not suffering, in other words, like Jesus did. Now obviously Christians see a deeper, spiritual dimension in their trials and crosses; but, as I said a few moments ago, the idea that suffering has value if it’s embraced for a righteous cause or for someone you love is something that almost everyone believes, including those who are atheists; including those who make fun of what the Catholic Church teaches about suffering. And that’s pretty easy to demonstrate. So why do they do this day in and day out? What’s wrong with these people? Are they masochists? Are they all into suffering for the sake of suffering? They endure these things—they suffer in these ordinary but very real ways—to provide for their families. They do it for a righteous cause, and for the people they love. Or how about our troops serving us in Iraq and Afghanistan and other hot spots around the world? Some of them (believers and non-believers alike) come home seriously wounded, with disabilities that they will have to deal with for the rest of their lives. And since many of them are in their 20s, the “rest of their lives” is likely to be a really long time! But it’s amazing how many of these brave soldiers say they are glad they were able to serve their nation in this way and make this kind of sacrifice. They’re convinced they made the sacrifice for a righteous cause (to stop terrorism and to promote freedom). And in this post-9/11 world, I’m sure many of them also see themselves as suffering for the people they love! In their minds, because of their willingness to give up an arm, or an eye, or a leg, their loved ones will be able to live in greater security here in the United States. Believers and non-believers alike know that suffering can have meaning and value; however those who have a deep faith in Jesus Christ have the ability to take it to a much deeper level. This last point was made beautifully during our parish mission, when Fr. Jordan Turano told us the very powerful story of Elisabeth Leseur. 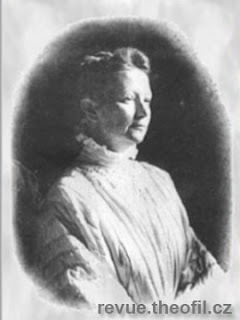 She was born in Paris in 1866, and in 1889 she married a medical doctor named Felix Leseur. Felix had been raised a Catholic, but in medical school he lost his faith, and eventually declared himself to be an atheist. And he was not just an ordinary atheist; he was a very “loud,” militant atheist—like Christopher Hitchens and Richard Dawkins today; so much so, that for a time he was the editor of an anti-clerical, atheistic newspaper in Paris, in which he constantly attacked the Church and people of faith. Interestingly enough, as time passed and Felix became more and more anti-God in his outlook, his wife Elisabeth became more and more devout. As you might imagine, Felix wasn’t too happy about this, and tried a number of times to “enlighten” his wife and undermine her ever-growing faith, but thankfully he never succeeded. In 1904 Elisabeth became seriously ill. She suffered terribly for 10 years, and eventually died of cancer. A couple of years before her death she made a very bold prediction to her husband: she told him that he would someday have a conversion of heart and return to the practice of his faith. She said it with incredible confidence. Then she went one step further. She said, “Felix, I know you. I am absolutely certain that when you return to God, you will not stop on the way because you never do things by halves. . . . You will some day be Father Leseur." 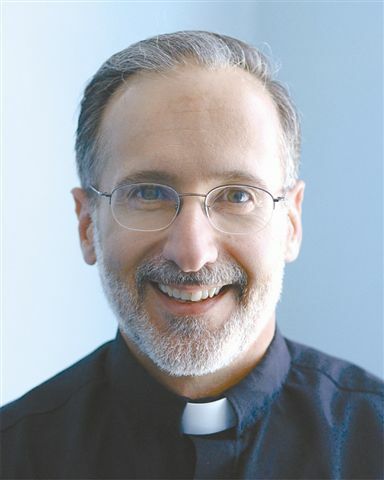 By the following year, Dr. Felix Leseur was a practicing Catholic again. And several years later, in 1923—at the age of 62—he was ordained a priest for the Order of Preachers, the Dominicans. He was married to Elisabeth for 25 years, and believe it or not he served the Lord as a priest for 27 years, dying in 1950. This is why the nuns always said to “offer it up”. Elisabeth Leseur did not embrace suffering for its own sake; she embraced it and “offered it up” for a very noble cause (a re-conversion to Christ), and for the person she loved most on this earth, her atheist husband. She did those things because she was truly “Catholic” in her attitude toward suffering. May the Lord help us all to be Catholic in the same way. Would You Have Missed Jesus? This man definitely would have missed him. Would you have missed him? If you had lived in Israel in the first century, and had a relationship with Jesus Christ back then just like the relationship you have with him right now, would you have missed him after he ascended to heaven on Ascension Thursday? I ask that question because we only miss people we care about; we only miss people we’re close to; we only miss people we know. Every once in awhile someone will say to me, “Fr. Ray, I miss him so much" (referring to a deceased relative or friend). Now I’ll do my best as a priest to empathize with the person in their grief and loss, but quite honestly it’s very hard to do if I didn’t know their deceased relative or friend myself! We only miss people we know: people with whom we have a close, personal relationship. The apostles missed Jesus when he ascended—they missed him terribly; the scribes and Pharisees did not. Nor did the people he hadn’t touched with is love and truth during his 3-year earthly ministry. For them, Ascension Thursday was just another day on the calendar. Sometimes our evangelical and fundamentalist Protestant brothers and sisters criticize us Catholics because many of us focus more on the rules of the Church than we do on the person of Jesus Christ. And as much as I hate to say this, to some extent I think they’re right! Now don’t get me wrong, I’m not saying that the rules and commandments of the Church aren’t important (if you’ve heard me for any length of time you know I would NEVER say anything like that! ); but I am saying that the center of our religion is a person, and not the commandments! So I ask you today: Why are you here at this holy day Mass? Is it simply because one of the rules—one of the precepts—of the Church says that you’ve got to be here every single holy day, and if you’re not you’ll commit a serious sin? Is that your first and perhaps only motivation? Or are you here primarily because you love Jesus Christ and want to grow closer to him through the grace you will receive in word and in sacrament at this Liturgy? I think many Catholics obey only because they fear; whereas in reality we’re supposed to obey because we love! We’re supposed to obey because we love Jesus and want to please Jesus and want to be faithful to Jesus and want to share Jesus with the world! 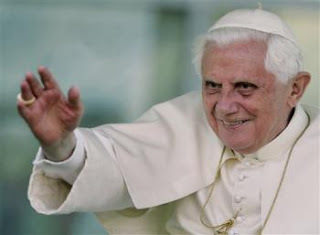 On that note, it’s no secret that Cardinal Joseph Ratzinger did not want to be pope. He had served the Church faithfully for more than two decades as head of the Sacred Congregation for the Doctrine of the Faith in Rome, and he was looking forward to retiring from that role and finally returning to his native Germany, so that he could go back to academia: back to the writing and the research and the teaching that he loved so much. Remember, for many years before he became a bishop, he was a university professor and a world-renowned theologian. I read his works in the late 1970s and early 1980s in college and graduate school and seminary. Then, of course, John Paul II died, and his fellow Cardinals elected him to replace his old friend. If Cardinal Ratzinger had taken the job only because he feared the wrath of God and the fires of hell, you can be sure we’d all be suffering the consequences right now, since he’d be a miserable man and a very angry pope! But he’s neither of those things, as we all know from his recent visit to our country. That’s because he accepted the call to serve as Holy Father primarily for all those Christ-centered reasons I mentioned earlier: because he loves Jesus and wants to please Jesus and wants to be faithful to Jesus and wants to share Jesus Christ with the world. If Pope Benedict had been there with Peter and the other apostles when Jesus ascended to heaven 2,000 years ago, he would have felt the same loss that they felt. He would have missed Jesus Christ as much as they did. That’s because he has a deep, personal relationship with his Lord and Savior. May the same be true of us. And may that relationship begin—or if it’s already begun may it be intensified—here today at this Mass.